Photometric analysis of CCD images is done with my own LYMM software which has been written over the last several years. It was developed especially for time series photometry of faint or moving objects. LYMM is very different to most commercial photometry software! LYMM is a command line program, and has no graphics whatsoever, so it is necessary to use it in conjunction with a program which does (I use AIP4WIN). It reads commands from the keyboard or from a script file. This approach has the advantage that you can build up complex analysis procedures step by step and - more importantly - have a record of what you did! LYMM insists on rigourous image alignment and accurate positions. 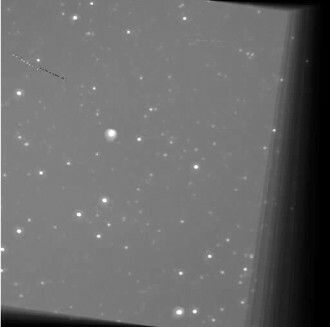 Forget about software which can only track a star if there is minimal movement from one frame to the next! LYMM calls a star search algorithm to find all the stars above a threshold in all the images you wish to process. You then define several fiducial stars, which are visible in all the images. LYMM then uses a pattern recognition algorithm to find the offsets and rotations, relative to the first, of all the subsequent images in the series. The image alignment table must be set up, before stacking images or doing photometry. Stacking images is then very easy - see the example. LYMM gives you various methods of determining positions, and in particular allows positions to be determined using the information in all the frames. Positions may be derived from centroids or PSFs; and you may use an individual frame, a stack of frames, or combine the positions determined in a number of individual frames. LYMM works well with moving objects. It converts the observed coordinates back to the standard reference system and then fits a curve so that smoothly varying positions - unaffected by noise - are available for the photometry. LYMM includes a powerful feature for assessing field star contamination to an asteroid light curve. The solution to 'what is the contamination at position n?' 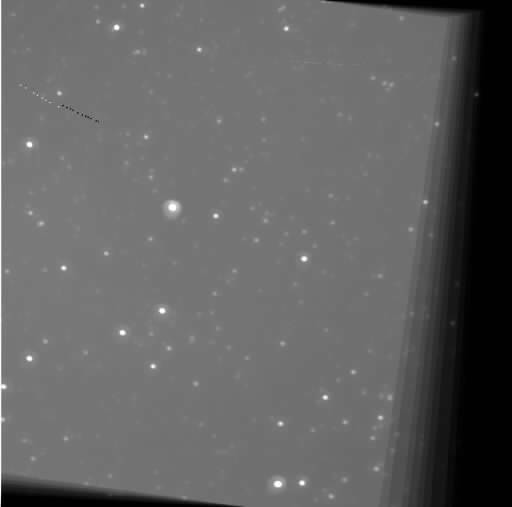 may be estimated easily by having the program do photometry at this position, but in (almost) all the other frames when the asteroid is somewhere else! LYMM can even be used for moving objects so faint that several frames have to be stacked to obtain a reliable position. Having defined the motion model, one can then perform photometry of object, which is almost invisible in the individual frames. (And why go to the trouble of using individual frames? Because stacks of frames have the problem that the field star PSFs differ more from that of the asteroid). LYMM offers a choice of two photometry methods: aperture photometry or optimal photometry (the latter for stationary objects only). You can do photometry of up to 10 stars at once. A PDF manual for the LYMM software is available (285 kb). If you are interested in the finer points of CCD photometry, you are strongly recommended to read Tim Naylor's paper, 'An optimal extraction algorithm for imaging photometry', MNRAS, vol 296, pp 339-346. You can access this via Tim's home page. An example of a series of images, from a fixed altazimuth mount, which were stacked with LYMM. Despite the field rotation, aligning and stacking them is easy! Images courtesy Roger Pickard.